Thank you to everyone who has left a comment on the last post - I really appreciate all the good advice. Who would have thought that we'd have so much to say about irons?! I've made mine in a thick textured cotton that originally came from my grandmother's stash so it could be many many decades old. 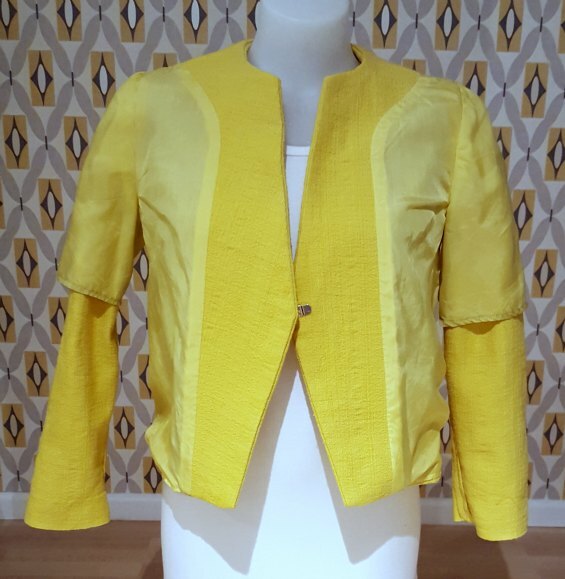 But it's such a cheerful colour, and the fabric has a nice thick weight to it so I just knew it would be perfect for a boxy jacket like this. The other change I made was to draft a neck and front facing from the lining pattern. The pattern suggests using a poplin fabric as the inner fabric and lining to the edge, which probably works ok when using a thick fabric like a fake fur. But I think a tailored jacket made with a jacket weight fabric looks better with self fabric facings because it prevents the lining peeking out and it sits better as well. I was super short on both lining fabric and the outer fabric for this project. 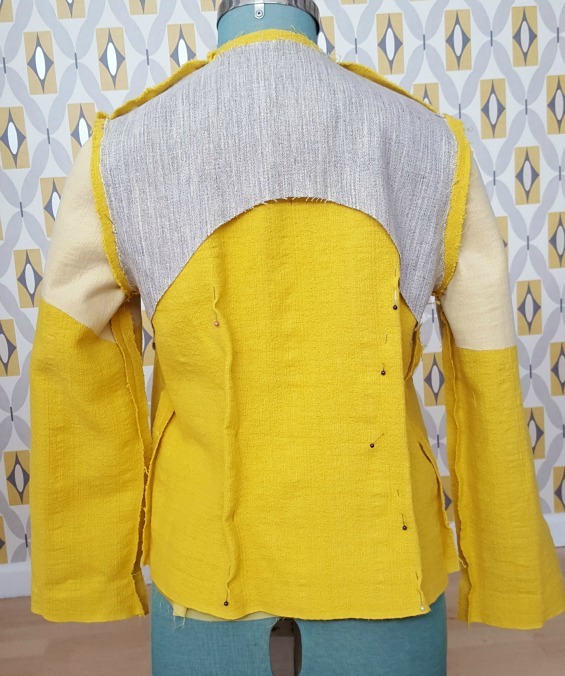 As you can see in the photo above, the sleeve lining is only half the sleeve purely because I didn't have enough yellow lining to make a full sleeve length and nor did I have any other light coloured lining fabric on hand for the sleeves. It's a bit slip shod, but it works and I've tacked it down to the seam allowance so it will stay in place. I also just managed to eek out the sleeves of the outer fabric by placing the sleeve end on the selvedge of the fabric with no fabric to turn up for the hem. Originally I thought I would just make this a bracelet length sleeve, but it finishes as just the right spot on me so I've left it unhemmed. For the seam allowances of the sleeve I turned the raw edges under and slipstitched them down, so it's quite a neat finish. Again, it's a bit of a dodgy solution but it works! 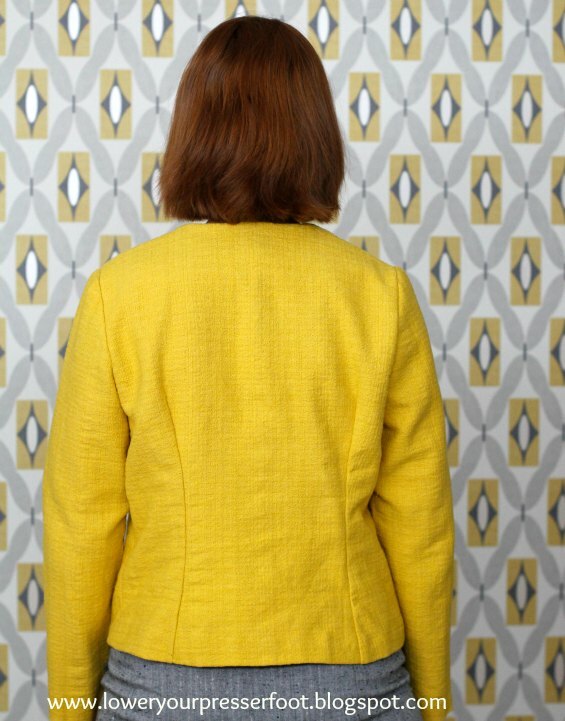 The pattern calls for a snap to be placed there at the centre front of the jacket. This fabric was too thick to make a covered snap, and nor did I have any big enough in my stash but I did have a hook and bar salvaged from a RTW garment some time ago. 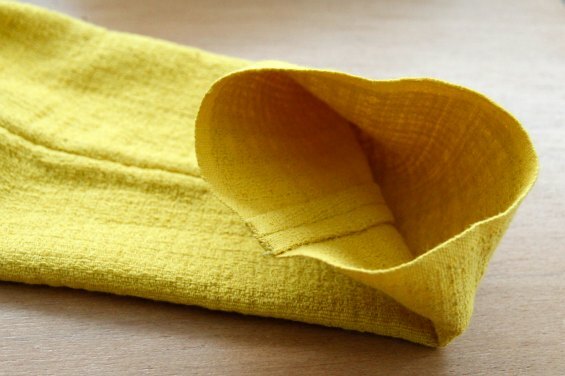 This is one of those that instead of sewing on you just push the ends through the fabric and use some pliers to squeeze the ends closed. Except I squeezed a little too hard with my pliers and the bar got a little bent as you can see below! (Ignore the colour of this photo, the yellow turned out all shades wrong in this picture for some reason). I do like the discreet look of the hook and bar though - it's hardly visible at all when the jacket is worn open, and it looks very polished not having any visible stitches. 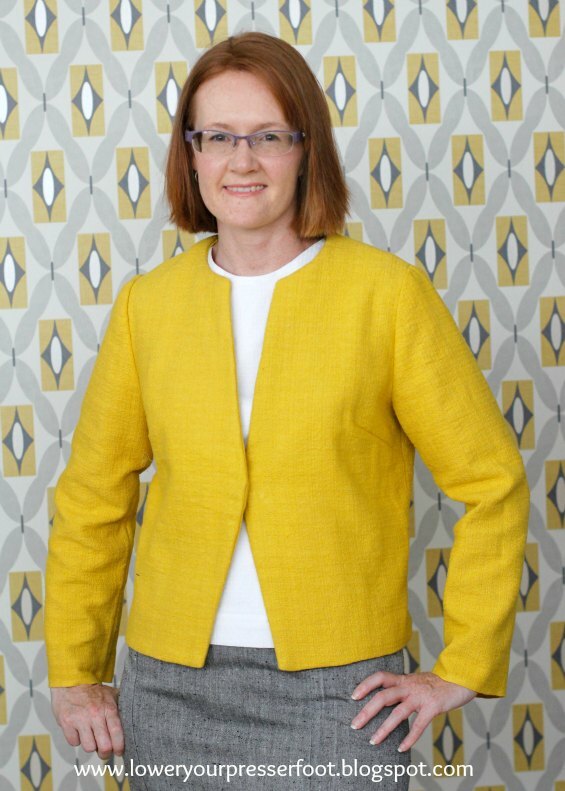 I've seen lots of collarless jackets with pointed front lapels in the stores recently, including the one below left in Trenery which originally retailed for $299, so I was very happy to see that Burda had included one in the January issue. The yellow colour came from an inspiration image I recently pinned from Table Eight - I'm quite glad that I finally used Pinterest for a real, actual use! So overall, I love this jacket immensely. It's very simple to make and doesn't use a great deal of fabric - I eked it out of 1.2m fabric but I did have to cut a few corners to make it work. For the next version (and yes, there defintely will be one) I will work on that excess fabric at the back, possibly by putting in a centre back seam instead of the darts and reshaping the armscye. 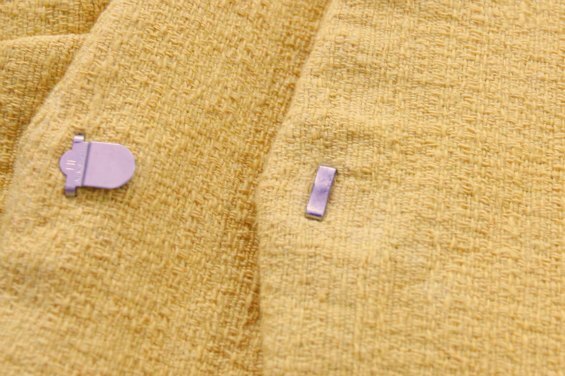 I would also narrow the sleeves somewhat as you can see in the photo above that they are quite wide. But apart from these minor fitting changes it is a great pattern that I can recommend if you're after something simple. Good luck to all of you doing a Burda challenge this year or those thinking about doing one - there were quite a few good patterns in this issue that should make it easier to choose, including this gorgeous vintage dress, this cute draped jersey skirt and this interesting double layer top. There I go again with the most literal and most boring blog post title ever! Before I get into that I must apologise for being a bad blogger - I haven't gotten around to responding to comments I received on my last post as yet. Plus, an email I received just recently from a lovely reader named Hannah who has bought an Orange Viking 3600 Husqvarna sewing machine just like this one I blogged about back in 2013 made me realise that people are commenting on some of my older posts but I'm not getting email notifications of them via blogger and hence I had no idea. So my apologies to anyone who has posted a comment on an older post of mine and I didn't respond - if you're still reading I promise you I didn't mean to ignore you. Ok, so on to this vintage pattern giveaway. I've been extremely busy these last few weeks and it has been super super hot so I haven't been doing much sewing at all, but I've reacted in that classic way of "if not sewing then buy sewing related stuff"! Admittedly the patterns and few pieces of fabric I bought in the last two weeks were from an op shop, but stash addition is still stash addition regardless of where it comes from. I bought a big box of patterns of mixed vintage (1950s-1990s) for the happy price of $10, which ended up having a few patterns that I already owned. 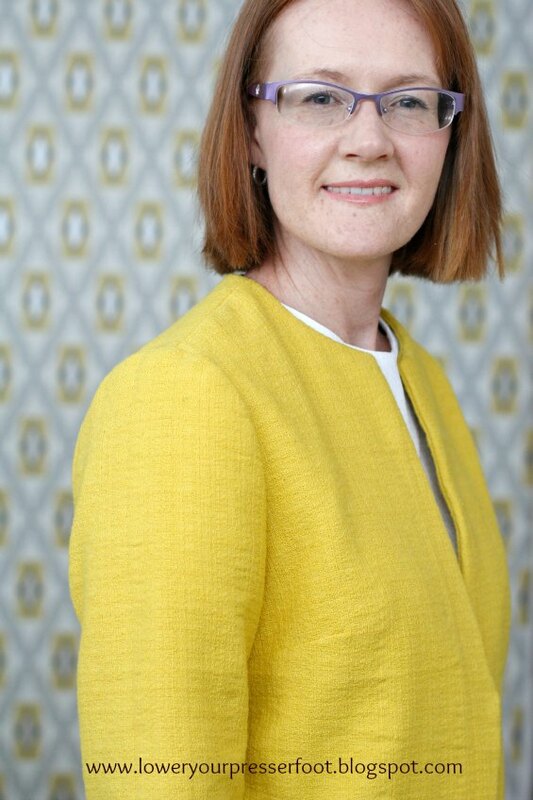 In the interest of managing my pattern collection, and sharing the love around I'm offering these patterns to any reader who would like them (happy to post internationally). 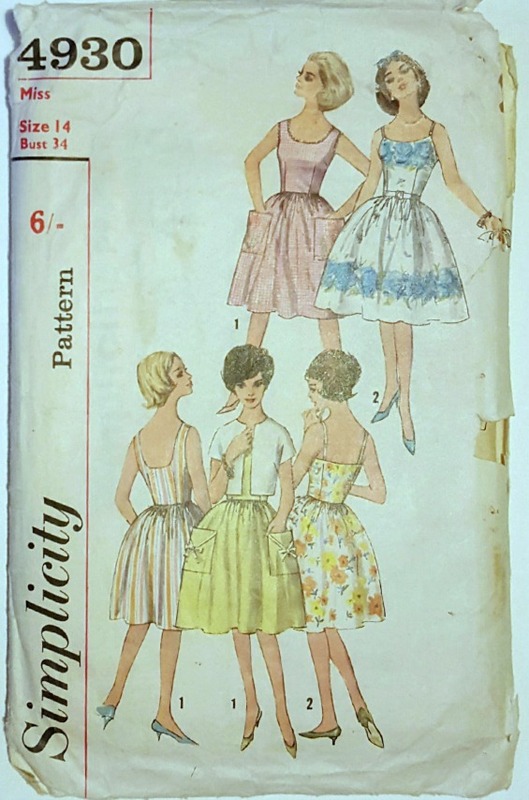 First up is Simplicity 4930, undated but probably early 1960s sundress and jacket pattern. It's for a size 14 - bust 34", waist 26" and hips 36". The envelope is a little battered but the instructions and pattern pieces are ok. 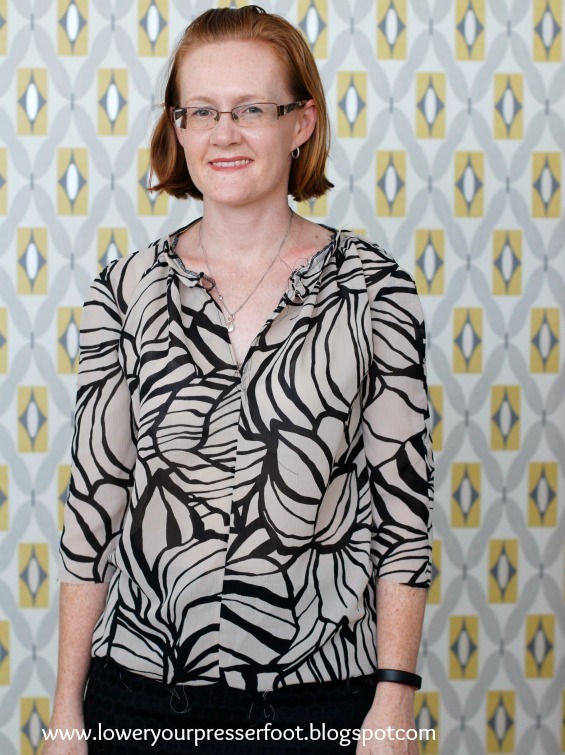 I actually made a dress from this pattern back in 2010 in an aqua/white stripe cotton which I still wear quite a lot, especially in this hot weather, so I can attest to this pattern being simple to make and just lovely. Next is Simplicity 2080, which even if you don't intend making it up is worth having just for the very cool cover art! It's also undated but again I think it's probably 1960s. 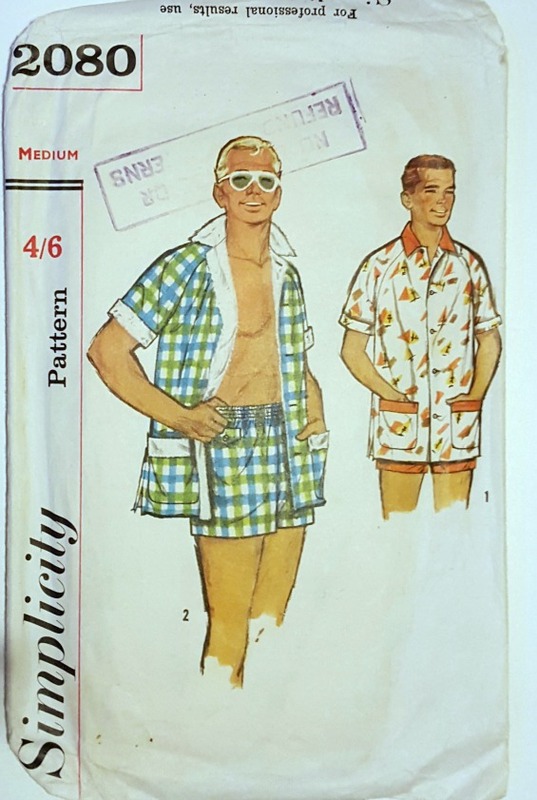 It's described as a men's beach set - a raglan shirt pattern and swim shorts. The medium size is chest 38-40" and waist 34-36". 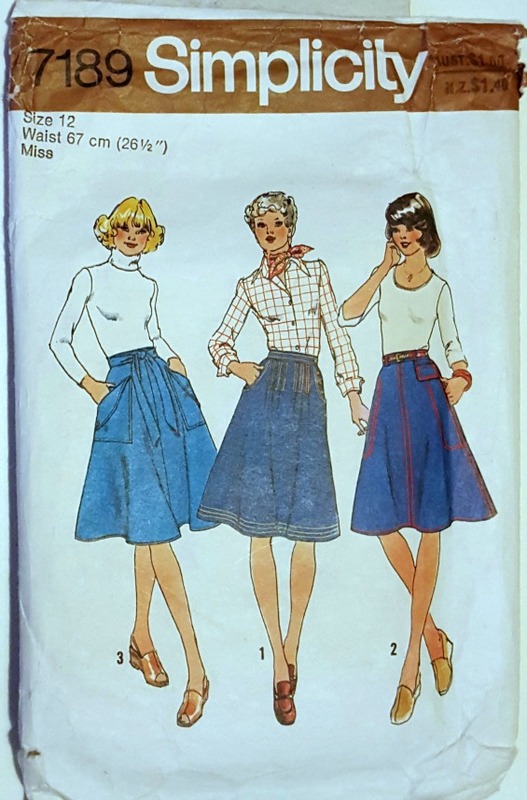 Lastly, there is Simplicity 7189, which is a 1978 skirt pattern with three variations: 1) a pleated front, 2) top stitched details and 3) a wrap skirt with waist band ties and gloriously oversized patch pockets. It's a size 12, which will fit a waist of 67cm/26.5" and hip 92cm/36". The wrap skirt version looks very much like a certain indie pattern released in recent years - why pay big $$ for the indie version when you can have the original design? In case you think I'm doing this purely because I am a lovely person - I do have an ulterior motive and I will make you work for it! In the comments please tell me what iron you're using and whether it's any good. I am in the market for a steam station irons, mainly because my iron seems to need refilling with water every two minutes but also because I have weak wrists and lifting a heavy iron is just no good for me. 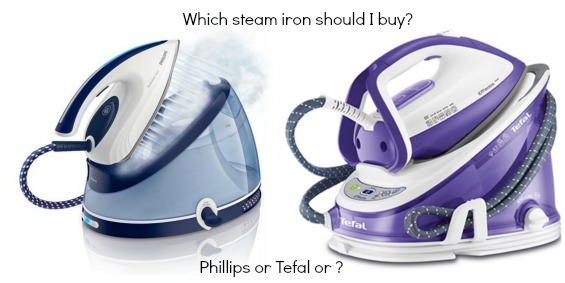 At the moment I'm leaning towards either the Philips PerfectCare Viva which has good reviews and is on sale at the moment, or the Tefal Effective Easy Steam Generator which also has good reviews and I've had great experiences with Tefal irons in the past. Both have large water tanks, long cords and are light which are my main criteria. Even if you don't want one of these patterns, feel free to leave a comment - it's a great opportunity to rant about a leaking iron ruining a beautiful nearly finished project to people who will sympathise, or to boast about your bulletproof iron that has withstood your cheeky cat knocking it to the floor to get your attention! Please tell me in your comment which pattern you'd like - if there is more than one request per pattern I'll do a random draw next Monday. And thank you all in advance for what I know will be your very helpful comments. Apologies for the blog silence - we've been away on a holiday and then had house guests which left me little time to sew or blog. 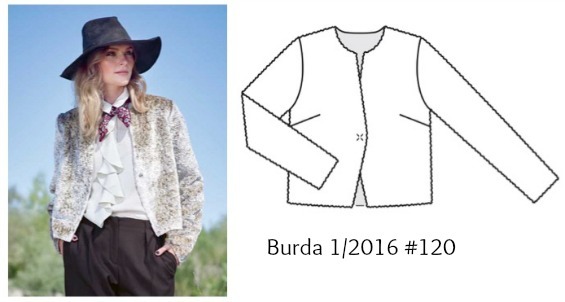 I managed to finish my December Burda project just after Christmas day and then managed to ruin my November Burda project on the morning of the 31st so I guess that counts in last year's tally, right? I really liked the patterns in both the November and December issues, but since they are all winter clothes and it's so hot here at the moment I always struggle to make something - I just can't bring myself to handle wintery wool fabrics when I'm feeling hot and sweaty. I definitely plan to revisit these issues when the weather cools down around here though, because there are some lovely tops in there. 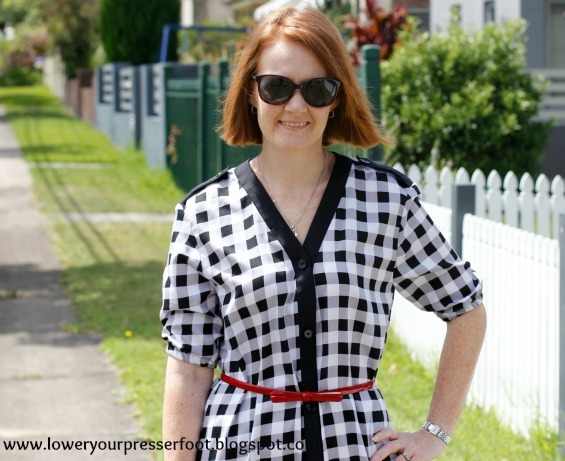 In the magazine this dress is made from a silk, with long sleeves but I made mine with with shorter sleeves finished with elastic so I could scrunch them up higher when need be. The fabric I used is a lightweight polished cotton in a check pattern (it's not actually gingham) which is very badly off grain. I tried all I could to straighten it which didn't work, but I figured that using a contrast band meant that the patterns didn't need to match, and the loose style cinched in with a belt would disguise it somewhat. I didn't have very high expectations from this dress given it's a style quite unlike what I usually make, but I've worn it a few times during the last two weeks and it's been great for the hot weather. 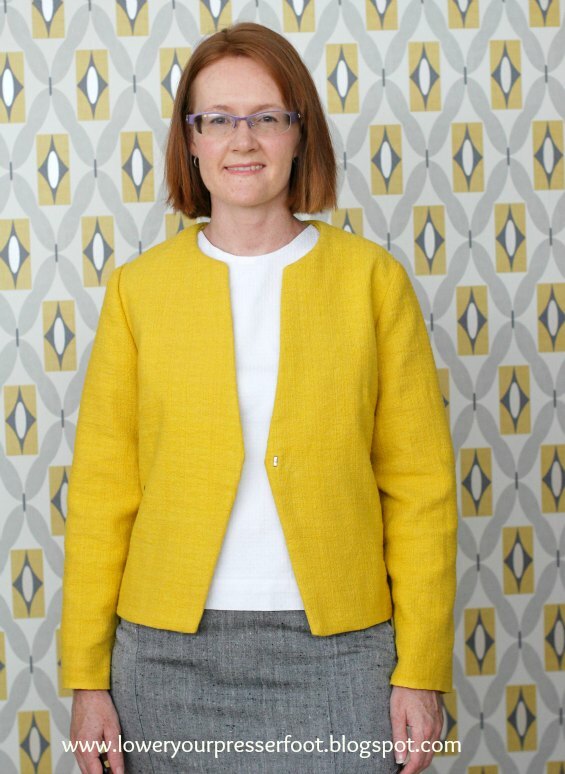 I didn't make any changes to the pattern, although I left off the patch pockets at the front because it looked a little too heavy in the contrasting black fabric but too disjointed in the checked fabric. 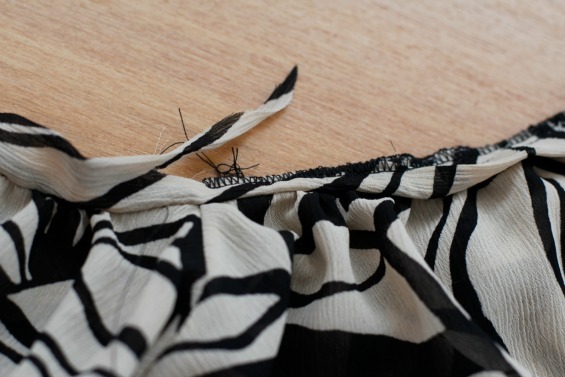 It was pretty simple to make, and I can highly recommend this pattern if you use a lightweight, drapey fabric. Instead of lace I used a crinkly polyester chiffon that has been in the stash for a very long time and was originally bought from an op shop so no great loss that it didn't turn out well. I started out making this properly, using French seams with was tedious with all those seams and the slippery fabric that wouldn't hold a press. It turned out that the top was too tight under my arms (not discovered until all the seams were sewn and the sleeves set in) which is not something I generally experience with Burda patterns. I couldn't bear the thought of unpicking all those seams in chiffon, so I decided just to finish the top to put it in the donation pile. There were a few things I didn't like about this pattern anyway. 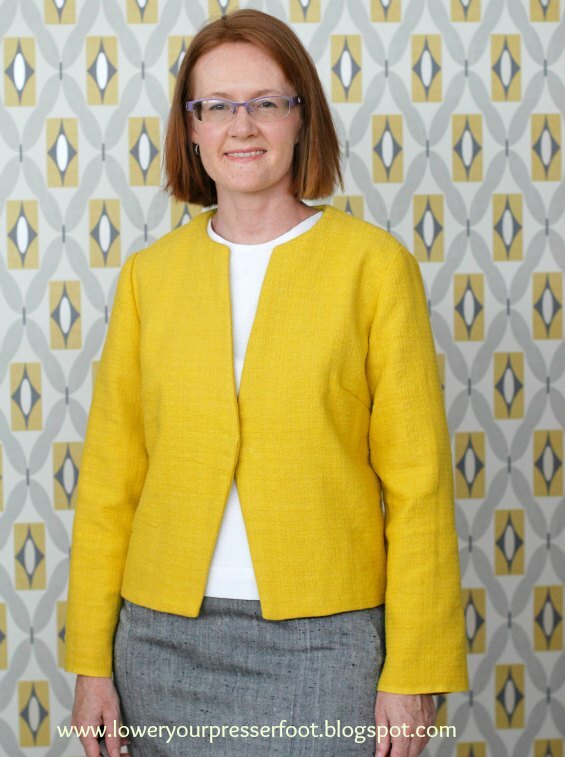 The pattern is the same as pattern #109 which was sleeves with ties so it has a two piece sleeve - totally unnecessary if you aren't making the tie end version and would be much better if it had a one piece sleeve instead. I also don't like the centre front seam - lots of Burda patterns have keyhole necklines with either facings or plackets which would have been preferable. And in case you're wondering, finishing these two projects does not mean that I finished my Burda challenge for 2015 - my May project is still in pieces after I pulled it apart to fix some fitting issues. My one and only sewing resolution for this year is to complete at least 10 UFOs this year (trust me, there are more than 10! ), so I plan on finishing that one soon.